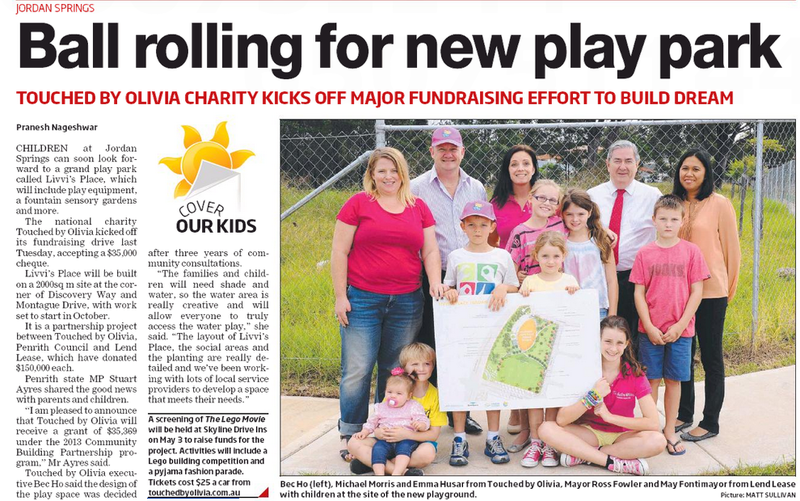 National charity Touched by Olivia kicked off their fundraising drive to build their first inclusive playspace in Western Sydney today, accepting a $38,000 cheque on the future site. Livvi’s Place is part of Touched by Olivia’s national strategy to work with communities across the country to create inclusive playspaces. Livvi’s Place Jordan Springs is a partnership project between Touched by Olivia, Penrith City Council and Lend Lease, who have both already donated $150,000 each. Stuart Ayres, State Member for Penrith, was thrilled to be on the Jordan Springs site to share the good news with parents and kids that Livvi’s Place had been granted $38,000 in the NSW Government’s Community Building Partnership fund after pooling funds with Member for Londonderry, Bart Bassett. Local parents were delighted to hear that the plans for the playground were ready for review after a long consultation period last year, and the kids were excited to see that what they had asked for was included. “Lend Lease is proud to have contributed towards the inclusive playspace at Jordan Springs. This playground will be a great source of fun for families in the region to use and for the first time allows an inclusive play environment for all children to enjoy. This outcome can not be achieved for the local community without Touched by Olivia Foundation, Penrith Council and Lend Lease all working together,” said Paul Gerlach, Regional Development Manager of Lend Lease. The design for Livvi’s Place was developed by world leading landscape architects, JMD after a 6 month consultation with community, who are invited to have a look and give feedback online and in person at the first fundraising event – a special screening of the Lego Movie at Skyline Drive Ins on May 3rd. Activities include a Lego building competition and Stockland Pyjama Fashion Parade. Tickets are just $25 per car and available online through Eventbrite.